Palm Bay: The Response That Denies All Logic And Fact. At the last Palm Bay Council meeting on March 21, 2019, we sent a representative to discuss again the unConstititution City Council rule that requires the City approve what may be shown on the projector screen in the Council chambers. We have been fighting this battle for some time and just when we think it can’t get worse, it does. We went up to the Council after Thomas Gaume addressed the Council in a meeting for what he termed “prior restraint,” which is unConstitutional and yet what he felt the City was practicing. We’ve spoken before on this ordinance and been ignored. The ordinance offers no definition of what is objectionable and is therefore overly broad. Individuals do not know exactly when their expressive conduct or speech crosses the line and violates the ordinance. Furthermore, as we have shown, objectionable speech is still protected speech and therefore the ordinance is unconstitutional because of both reasons. 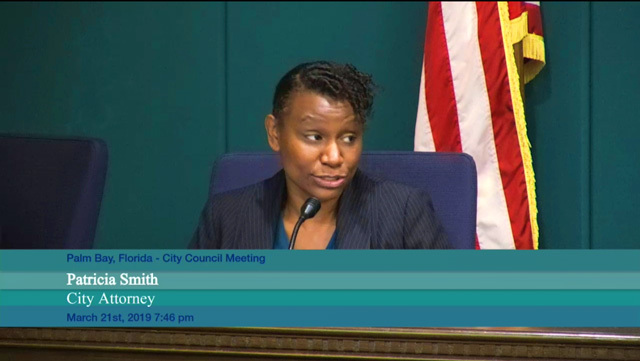 Given that as a backdrop, Ms. Smith’s answer to Councilman Bailey was wrong. In 1952 in Wieman v. Updegraff the Supreme Court ruled that laws that “chill speech” – that dampen the free expression of speech are unconstitutional. That’s what the ordinance does. It has a chilling effect on people like us who don’t want, seek or need the City’s approval of our protected speech. The Supreme Court clearly disagrees with Ms. Smith. When the modification to the time limit for submitting presentations was offered, Councilman Bailey noted “we all know why the ordinance was made.” We do. It was for the City to see what was going to be said before it was said and approve of what was said. That’s the genesis of the law. Yet the City Council, a member of which ordered the ordinance to be written by the City Attorney then turns around and says “we have to listen to the City Attorney on this.” That’s the same City Attorney’s office that works for the Council and not the people, and was directed to write the ordinance to begin with. It’s a great circular system. Tell the office what to do and then rely on the office to justify it. Please stop the unconstitutional madness this ordinance imposes. Mayor Capote let City Attorney Smith respond. Her response can be seen starting at 00:47:15 of the meeting which can be viewed here. Mayor, prior restraint involves something that actually seeks to censor speech. It is providing regulations on speech based upon its content. Essentially, it seeks to suppress speech. A regulation is not a prior restraint it is a valid time, place and manner regulation. Our regulation that seeks not to suppress based on its content, but actually only seeks to see if it poses a threat to our network. It’s not content based at all. And the Supreme Court has said a valid time, place and manner regulation even if it has an incidental effect that some people are “chilled” because we have it, if it is incidental, it does not make the regulation invalid. This is not the first time that Smith has tried to rely on “time, place, and manner” restrictions. Her position failed previously, and it is no more accurate today than it was the first time she tried it. To understand why it fails, one must first understand what “time, place and manner” restrictions are. Time restrictions regulate when individuals may express themselves. No one, least of all us, is arguing that the City cannot impose regulations on when people can express themselves. In a Council meeting, the City places a “time” restriction on when in the agenda people may speak. There is an agenda item for public comments that do not concern other agenda items, and time within agenda items for comments that deal with that item. These regulations serve what is called a “compelling government interest,” which in this case is the smooth running of a Council meeting. Place restrictions regulate where individuals may express themselves. This is actually a two-fer in that the government may regulate the forums in which one may express themselves as well as where in that forum the speech takes occurs. The Supreme Court has recognized three forums of public expression: traditional public forums, limited public forums, and nonpublic forums. A City Council meeting is a “limited public forum” and to express oneself the comments must be made from the podium or other area designated by the Chairperson of the meeting. Notice once again that neither we nor anyone else is challenging this. Manner restrictions regulate the mode of individual expression. If the City wants to shut down the projector and the screen so no one uses it, that’s fine. They can do that. What they cannot do is pick and choose what is allowed to be shown on the projector. Smith says such content discrimination is not taking place. We disagree and the very Council rule Smith relies on requiring the City to approve what is shown on the projector / screen proves it. A. Members of the public wishing to use electronic media when addressing city council must provide the electronic file to staff for screening no later than 2:00 P.M. on the day of the meeting. Screening ensures that the material is in a format capable of broadcast or presentation over the audiovisual system, and assures that the material is legally appropriate for broadcast over the audiovisual system and cable. No visual materials may be displayed through the audiovisual system that City staff has not screened. No visual presentations containing offensive material will be displayed or utilized in any fashion. The City is screening for what it calls “offensive material.” The City doesn’t want things that it finds “offensive” to be seen. Smith also mentions the idea that the City has the right to protect its computer network. We’ve gone down this path before. Prior to the implementation of the rule, people could hand their presentations to the IT person at the meeting who would scan the files for viruses and if everything was okay, they were allowed. The files were isolated on that one computer. With the new rule, a person can send the presentation file to anyone in the City. We ask simply, “which makes the City network more open to attacks? Putting the files on one computer which is isolated from the network via “sandboxing?” Or allowing the files to be sent through the City email servers to anyone of 770+ nodes and access points? It should also be noted that when this rule was passed, the security of the City’s network was never discussed. It was not the driving reason for the rule. It is ridiculous for the Smith to say “we do this because of the network” when the rule says otherwise. No one can argue that the City’s aims of protecting their computer network is achieved better and more effectively with one sandboxed computer scanning files rather than the files being sent through the City’s servers and therefore exposing the network to risk because of the very regulation the City has imposed. This is simply a case where Smith is trying to protect the wishes of the City Council members rather than uphold the laws and Constitution of the United States and Florida. When one looks at the facts, there is nothing that supports Smith’s contentions and statements. Real quickly just want to say for the record, that in my two and a half years of being here, we have never stopped anyone from speaking at that podium. We have listened to phone messages, we have seen videos, and we have never instigated (sic) anyone from not speaking as far as I’ve seen. In the two and a half years I’ve been here we have never once cut anyone off at that microphone except for the buzzer going off and we let them go beyond the buzzer many number of times. We have listened to telephone messages, cell phone messages, home videos so I think we are pretty liberal with what we let people say and do here in the Council and I just wanted to point out in my two and a half years, we have never stopped anyone from saying what they wanted to say at that microphone. Government regulations on speech must serve a “compelling government interest.” In other words, the regulations need to address a concern or problem and not just be made up willy-nilly. By Anderson’s own admission, this rule has no need, no compelling interest and serves no purpose other than for the City of Palm Bay to censor you before you say something and or to know what you will say before anyone else does. “Freedom of speech” means we – the people – control what we say and not the government. At the meeting before this they actually admitted that they had forwarded my presentation to all of Council and much of staff, and all stood prepared with statements to debate the content in my presentation, exactly what they had claimed they would NOT do in prior meetings. You mean to say that the City Council, and the staff lied to you? We are shocked. Shocked we tell you. Shocked.